ALDAN, Penn. — A non-denominational church in Pennsylvania has voted to boot the Boy Scouts of America from their premises over the organization’s amended policy permitting openly homosexual boys to serve as members. Aldan Union Church is located just outside of Philadelphia, and has had an amicable working relationship with the Boy Scouts for 93 years. However, due to the decision earlier this year to lift the organization’s ban on open homosexuals, the church decided that it was time to cut ties. He said that the decision was based on the church’s conviction to stay true to Scripture. He said that he was also concerned that the Scouts decided to take a vote on matters of morality as if right and wrong are based on public opinion. Therefore, the board of elders, comprised of 21 members, voted almost unanimously late last month to discontinue sponsoring one Boy Scout and one Cub Scout troop. Gregory Daniels, scoutmaster for Pack 2, advised the Inquirer that he understood the church’s decision, even though he disagreed. 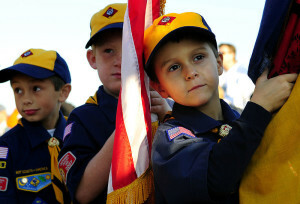 As previously reported, a number of churches across the nation are similarly cutting ties with the Boy Scouts of America over its amendment policy. Pastor Mike Shaw of the First Baptist Church of Pelham, Alabama is among those ending his alliance with the Scouts. He recently explained that his church could not in good conscience support the acceptance of sinful behavior. Pastor Tim Hester of Southeast Christian Church in Louisville, Kentucky met with his board of elders this past June, which likewise decided not to renew its charter with the Boy Scouts. The Aldan Scouts will now meet at the local American Legion beginning in January.